Robert’s Snow Art Auction for Cancer’s Cure: Final Auction Begins! Auction 3 will begin accepting bids on Monday, November 26th, 2007 at 9:00 a.m. with a starting bid of $50 for each snowflake. All bids must be placed before the close of Auction 2 on Friday, Nov. 30 at 5:00 pm.Remember that 100% of the proceeds from this online auction will benefit sarcoma research at Dana-Farber Cancer Institute, and that all but $25 of the winning bid is tax deductible. A big Thanks! to Tricia Stohr-Hunt for making this list of links available, and to Jules and Eisha for organizing the Bloggers’ Brigade to promote the Robert’s Snow Online Auction for Cancer’s Cure. Robert’s Snow Art Auction for Cancer’s Cure: Auction #2 Begins! Auction 2 will begin accepting bids on Monday, November 26th, 2007 at 9:00 a.m. with a starting bid of $50 for each snowflake. All bids must be placed before the close of Auction 2 on Friday, Nov. 30 at 5:00 pm. Remember that 100% of the proceeds from this online auction will benefit sarcoma research at Dana-Farber Cancer Institute, and that all but $25 of the winning bid is tax deductible. Graeme Base at Just One More Book! Robert’s Snow Art Auction for Cancer’s Cure: Bidding Begins! Starting Monday, we’ll all have a chance to purchase the artwork of a favourite children’s book illustrator while helping to fight cancer — by participating in a unique fundraiser for cancer research: Robert’s Snow: for Cancer’s Cure. Since 2004, this online auction has raised over $200,000 for The Dana-Farber Cancer Institute and, with your help, the holiday tradition will thrive in 2007. Auction 1 will begin accepting bids on Monday, Novenber 19, 2007 at 9:00 a.m. with a starting bid of $50 for each snowflake. All bids must be placed before the close of Auction 1 on Friday, Nov. 23 at 5:00 pm. Don’t forget that 100 percent of the proceeds from this online auction will benefit sarcoma research at Dana-Farber Cancer Institute, and that all but $25 of the winning bid is tax deductible. 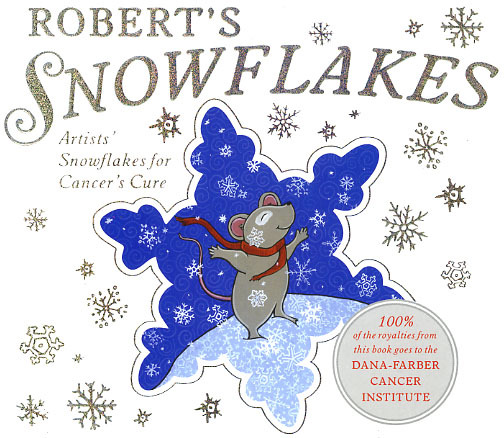 Starting November 19th, we’ll all have a chance to purchase the artwork of a favourite children’s book illustrator while helping to fight cancer — by participating in a unique fundraiser for cancer research: Robert’s Snow: for Cancer’s Cure. Since 2004, this online auction has raised over $200,000 for The Dana-Farber Cancer Institute and, with your help, the holiday tradition will thrive in 2007.In order to raise awareness of and participation in this fabulous fundraiser, we in the kidlitosphere community will be highlighting ~160 of the 200 or so individual illustrators who have created snowflakes for the upcoming 2007 auctions — and giving you a peek at the unique snowflakes they have made. A big Thanks! to Tricia Stohr-Hunt and Jen Robinson for making this linked schedule available, and to Jules and Eisha for organizing the Bloggers’ Brigade to promote the Robert’s Snow Online Auction for Cancer’s Cure. On this edition of Just One More Book!, Mark speaks with illustrator Laura Huliska-Beith about the inspiring over-the-top optimism of the 1950s, how a pair of roller blades and an obedience school drop-out influenced her children’s book illustration career and her 2007 snowflake, Three French Hens. Laura’s feisty, festive snowflake is up for bids December 3-7, 2007. We will soon have a chance to purchase the artwork of a favourite children’s book illustrator while helping to fight cancer Ã¢â‚¬â€ by participating in a unique fundraiser for cancer research: Robert’s Snow: for Cancer’s Cure. Since 2004, this online auction has raised over $200,000 for The Dana-Farber Cancer Institute and, with your help, the holiday tradition will thrive in 2007.